The hardest part about creating a successful company isn’t building your product. It’s easy to spend months working on features, but how are you going to sell those features? How will you describe your product to ensure customers are interested in it? Where will you find enough customers to tell about it? How will you differentiate your product from the competition? What features should you talk about most on your landing page? You know customer interviews are an indispensable tool for tech startups, but I wanted to show you just how universally powerful they are by telling you about Dr. Emily. 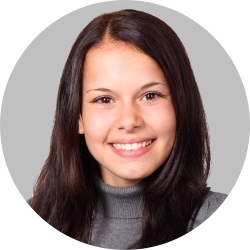 Dr. Emily was a School Psychologist working intense hours at elementary schools in urban areas. She loved the work she did, but she thought she could have more impact if she worked outside the confines of schools. She didn’t know how to sell her services. Dreading having to become a sales-person, which felt uncomfortable and a little sleazy, Dr. Emily tried interviewing her customers hoping to find an easier way to start her company. What she found, not only shocked her, but her competitors too. What Did Dr. Emily Ask? As I mentioned in my last article, Dr. Emily focused on interviewing customers who were already trying to solve the problem she wanted to solve. Her Early Adopters were parents who already had their children assessed for learning disabilities, but were still searching for answers. Q: What’s the hardest part about being the parent of a child with a learning disability? Notice how the answer to just this one question provide extremely powerful marketing copy. No mind games, no sleaze and no hard selling. Dr. Emily just asked her customers about their problems, and restated the services she provides using their words. If you listen to your customers…they’ll write your marketing copy for you. Q: What’s not ideal about your previous assessment? A: We got the diagnosis, but don’t know what to do next. With the answer to this question, Dr. Emily learned how to differentiate herself from her competitors. If you listen to your customers…they’ll tell you how to beat your competitors. Her competitors typically took 3 – 5 years to fill their client list. Dr. Emily did it in 18 months. Dr. Emily now has a 4-month waitlist for her assessments. And that’s after doubling her price over the last 18 months. With the power of customer interviews, Dr. Emily was able to build a successful company in a crowded space, with absolutely no sales experience at all. Interviews will teach you how to sell. Remember that building your product is the easy part…selling it is the hard part; and interviews will do the heavy lifting. You can get help creating your sales strategy. The first workbook in the FOCUS Framework will walk you through every step of the interviewing process. 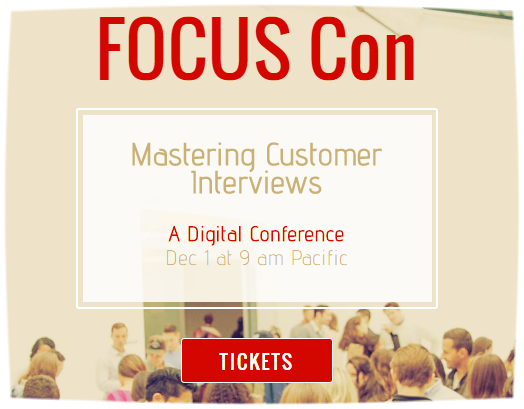 This first FOCUS conference is December 1st and it’s dedicated to Mastering Customer Interviews. All with live workshops, networking and personal mentoring (and without the expense of plane tickets). *Dr Emily’s name and photo have been changed to protect the anonymity of her clients.